NEW STOCK JUST ARRIVED AND IN SIMPLY STUNNING CONDITION. 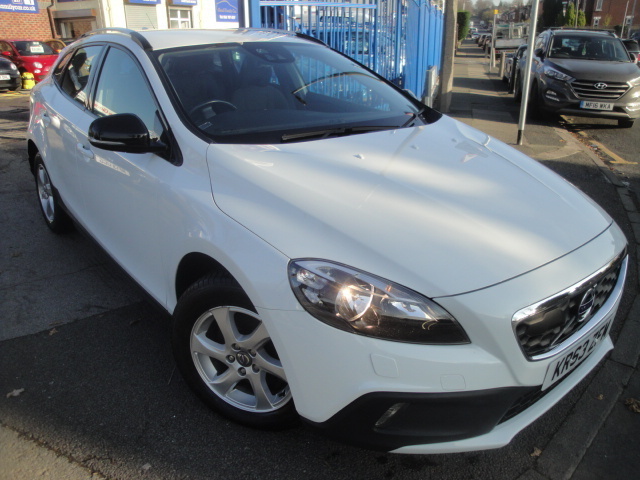 THIS V40 CROSS COUNTRY HAS BEEN SUPREMELY MAINTAINED BY ITS PREVIOUS OWNER AS THE CAR COMES WITH EXCELLENT SERVICE HISTORY. THE CAR HAS 2 OWNERS RECORDED ON THE V5, THE FIRST BEING THE MANUFACTURER AND THEN 1 PRIVATE OWNER. THE CAR IS FINISHED IN ICE WHITE PAINTWORK WITH A DARK PART LEATHER INTERIOR AND COMES WITH A FABULOUS LEVEL OF SPECIFICATION OVER AND ABOVE STANDARD. OPTIONAL EXTRAS INCLUDE ACTIVE DIGITAL DASHBOARD WITH 'TFT' DISPLAY, 'BLIS' - BLIND SPOT INFORMATION SYSTEM, 'PILOT ASSIST' - ADAPTIVE CRUISE CONTROL & LANE CHANGE INFORMATION, FACTORY FITTED SATELLITE NAVIGATION, BLUETOOTH CONNECTIVITY, POWER FOLD MIRRORS, REAR PARK ASSIST AND HEATED FRONT SEATS, ALL OF WHICH MAKES THIS AN INCREDIBLY WELL SPEC'D EXAMPLE INDEED ! ALL OF THIS SPEC IN ONE CAR AND IT IS £0 TO TAX TOO !!! SERVICED AT 3643, 16271, 28618, 41248, AND 66562 MILES.